Taken from the grade book of a teacher who is frustrated at watching his students flunk assignments because they’re forgetting to do things like put their names on their papers, here is the Steelers Report Card for the 2018 loss to Denver at Mile High Stadium. The return games were non-elements for both teams. Jordan Berry had a sound day kicking and Chis Boswell made all of his kicks – save for the one that got blocked, which is inexcusiable given Denver’s tape on that front. Not that he, or more importantly Art Rooney II pay much attention, but Steelers coaches haven’t felt much social media heat during their five game winning streak. That ended with the loss to the Broncos. As if Mike Tomlin and Randy Fichtner are somehow responsible for turnovers. On offense it is easy to second guess Randy Fichtner’s short-passing game plan, but the truth is that he kept Ben Roethlisberger clean, the Steelers moved the chains and led in time of possession. None of that mattered much thanks to two end zone turnovers. While the turnovers were the key to the game, they do obscure an afternoon that was rougher for Keith Butler’s defense than most commentators are acknowledging. While the defense didn’t revert to its September form, it gave up several long plays and struggled against the run. 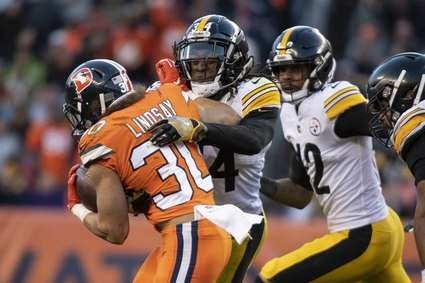 Moreover, as Mike Tomlin indicated in his press conference, the Steelers defense could have altered the dynamic with a turnover, but none was forth coming. Von Miller is easily the NFL’s most dynamic defensive player today. He’s got a Troy Polamaluesqe ability to make game-changing plays at critical moments. Being asked to start your first game against him cannot be easily. 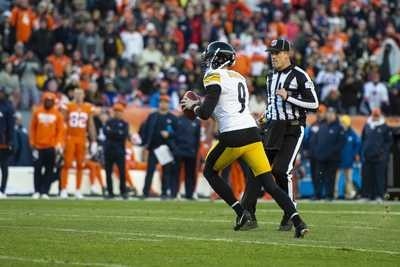 But that’s what the Steelers asked Chukwuma Okorafor to do, Okorafor delivered and for that he win the Unsung Hero Award for the Steelers latest loss to the Broncos at Mile High. This entry was posted in Steelers 2018 Season, Steelers Report Card and tagged Alejandro Villanueva, Antonio Brown, Art Rooney II, Ben Roethlisberger, Cameron Heyward, Chris Boswell, Chukwuma Okorafor, James Conner, James Washington, Javon Hargrave, Jesse James, Joe Haden, Jon Bostic, Jordan Berry, JuJu Smith-Schuster, Keith Butler, L.J. Fort, Mike Tomlin, Pittsburgh Steelers, Randy Fichtner, Roosevelt Nix, Ryan Switzer, Sean Davis, Steelers offensive line, Steelers report card, T.J. Watt, Terrell Edmunds, Vance McDonald, Vince Williams, Xavier Grimble. Bookmark the permalink. Eli Rogers Practices. Should Justin Hunter or James Washington Look Over Their Shoulders?